JANUARY 24, 1990. In Auckland, the Commonwealth Games would open and Kiwis would be preparing to run, jump, swim, peddle... whatever.., in competition against athletes from around the globe. In Wellington, a small team of broadcasters would be making their own preparations. They would be setting out in pursuit of international competitors who had left them far behind in the race to spread influence and foster goodwill in the South Pacific. 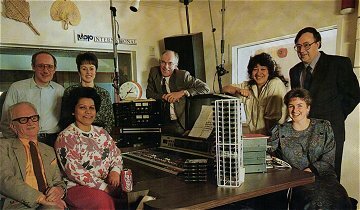 That was the day Radio New Zealand International – with a new, much more powerful transmitter and $1.1 million a year from the Ministry of External Relations and Trade – began broadcasting an expanded programme. There were no big headlines about the broadcasters, their operations or their aspirations that day. They went to air without much fuss or publicity, at least in this country. Well known New Zealand broadcaster Ian Johnstone heads Radio New Zealand International, our voice to the world. Now, finally, it is a voice that should be heard. But it was a gold-letter day for RNZ International manager Ian Johnstone, one of the country’s best-known broadcasters. He rates it among his career highlights (along with his chairing the 1984 election debate on TV between David Lange and Sir Robert Muldoon and a documentary about apartheid and racial tensions in South Africa). 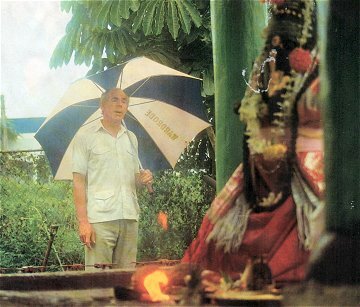 He recalls the opening hour and a half programme, and “all these Pacific voices kept coming in.. and there were greetings from Kiribati and Fiji and Polynesia. There was a warmth about it all which made you think that people did want to hear from us again”. So Johnstone, aged 54, and his staff (you can count them on two hands) began projecting New Zealand overseas. But at home they would remain a low-profile operation until August, when an attempt would be made to beam the voice of the Prime Minister, then Geoffrey Palmer, into the Middle East, in the hope of bringing comfort and reassurance to New Zealanders held hostage in Kuwait and Iraq. Johnstone had conceived the idea while closing a night’s transmission, typically with the sending of greetings to expatriate New Zealanders wherever they might be. 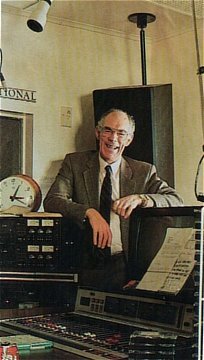 This time, Johnstone sent “a special ‘We’re thinking about you all, and if you can hear this, well Godspeed’.” Then, as usual, he played “Now is the Hour” and wondered if it would be better if the hostages heard from somebody who could speak for the whole country. The Prime Minister’s Office agreed to his approach. Palmer’s message was recorded and transmitted. The New Zealand Embassy in Iraq expressed doubts that it reached any of the hostages, but in the summer RNZ International had broadcast commentaries of the Indian cricket tests and received letters from expatriate Indians who had heard it in the Gulf states. “So we knew we could be heard there”, Johnstone muses, although there was heavy jamming in the area after the hostages were taken and countries with bigger transmitters were trying to get in. He did hear from a Kiwi in Bangladesh, who wrote to congratulate him for the initiative. Letters, in fact, have poured in since January from 67 countries, including Nigeria, Zaire and Finland. The service received 5000 letters in the first six months. Johnstone reckons 4500 came from countries outside the Pacific. 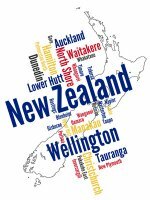 Many come from ‘DXers’, others from people curious about New Zealand. There was the man who rang from Cincinnati. "He said `here you are’, and he put the phone over his receiver, and it was crackling. And he said, ‘I know you and Australia are very definitely different countries’. And I thought, well that’s something achieved..."
But the programming is pitched primarily at the South Pacific Forum area, from Papua New Guinea in the west across to Pitcairn in the east. Johnstone describes this as the “service area” (he dislikes saying “target area” because “it sounds like you’re lobbing propaganda missiles at them”). The idea, rather, “is to put New Zealand back in touch with what I like to call the rest of the South Pacific”. Ian Johnstone, RNZ International Manager, in Fiji. Keeping in touch is a matter partly of enhancing New Zealand’s reputation and image, of being heard and establishing a presence in the region. But another consideration has been the huge growth of Pacific communities in New Zealand, and the recognition that these communities should maintain links with their families back home. special occasions that gave an urgency to Radio New Zealand’s plans. Covering these events, as it turned out, meant the service went to air before the new transmitter, installed at Rangitaiki, 40 kilometres east of Taupo, was ready. “There have been a number of teething troubles,” Johnstone concedes. He is confident those problems have been sorted out, “we are coming right now." 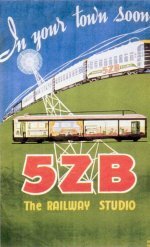 But the history of New Zealand’s short wave service – which dates back to September 26, 1948 – has been one of teething troubles, growing pains, technical shortcomings and inadequate financing. Peter Fraser, the Prime Minister then, envisioned it as a means of promoting good relations with our Pacific neighbours and of presenting them with “an accurate picture of life in New Zealand”. For more than 40 years, the vision and the picture were blurred by a myopic mix of bureaucratic apathy, governmental neglect and public indifference. Fraser’s good intentions were entrusted to two second-hand World War II transmitters. Each capable of just 7.5 kilowatts, they had been installed for Morse transmission. After the war they were converted for short wave broadcast transmission and set up at Titahi Bay, on the coast just north of Wellington, at a time when most countries were relying on 50 kilowatt power for international broadcasting. 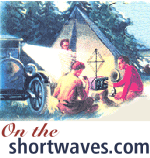 Not surprisingly, their signals were easily drowned by Radio Australia and a host of other short-wave stations. Last year, these museum pieces were still on active duty, carrying an 11 hours-a-day service which, according to a Radio New Zealand International executive, could not be heard in Fiji. Just how far the aged transmitters could push their signals perhaps was arguable. When Foreign Affairs Minister, Russell Marshall referred to a “tin whistle” service. Arthur Dalby rejoined indignantly in a letter to the Dominion. Maybe so. But it was generally acknowledged that there was only one weaker signal in the world... a 5 kilowatt transmitter in Uruguay that was broadcasting into neighbouring Argentina. Radio New Zealand’s chief executive, Beverley Wakem, referred last year to “two clapped-out postwar transmitters held together by prayer and number eight fencing wire”. Radio New Zealand by then had become a state-owned enterprise, charged with operating efficiently and profitably against fierce private-sector competition in a commercial environment. 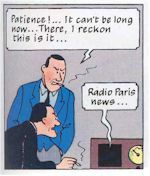 The international service did not rank high in priorities when heavy financial demands were being made on local radio, Wakem explained. 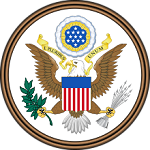 In fact, the daily short-wave service had been under threat of abolition since 1982, when it lost the annual grant of $180,000 from the Foreign Affairs vote that had sustained it since 1975. Australian-sourced programmes would ensure the Pacific region was not deprived of a service, Foreign Minister Warren Cooper had said in a blasé justification of the controversial decision to stop the grant. Furthermore, programmes being beamed into the South Pacific from New Zealand were “pretty pessimistic and don’t show New Zealand in the best light possible”. Over on the opposition benches, during a snap debate on the decision, Jonathan Hunt promised: "Immediately there is a Labour Government. we will restore the service.” It nevertheless took more than five years to translate that promise into the rejuvenated service that took to the airwaves on January 24. The Broadcasting Corporation had maintained the service after the grant was abolished, but it stopped making special short-wave programmes and, bit by bit, the service was downgraded. 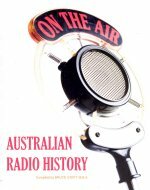 In contrast, the Aussies were stepping up their activities through Radio Australia, the short-wave arm of the Australian Broadcasting Commission. The magazine Island Business by 1983, was observing that Radio New Zealand used to have the South Pacific to itself, but events were showing the Aussie rival was already out in front. 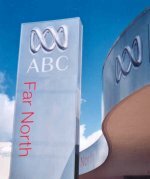 Radio Australia carried the most up-to-date and informed reporting on a constitutional crisis in the Cook Islands of any of the services. Then came the coups in Fiji, which further exposed New Zealand’s increasing inability to be heard in South Pacific affairs. The Otago Daily News snorted indignantly in an editorial: “Put simply, the voices of other countries have been heard in Fiji easier, louder and longer than have ours.” And even Bangladesh had two 50 kilowatt transmitters for international broadcasting. Criticism was reinforced by Polynesian leaders, who were pressing Radio New Zealand not only to expand its broadcasting to the Pacific Islands but also to increase the Polynesian content of domestic broadcasts. The tide was turning. 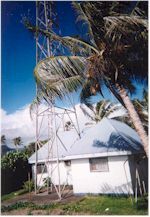 By the end of 1988, the Ministry of Foreign Affairs was preparing proposals for funding an improved New Zealand short-wave radio service in the Pacific – essentially because the service was being recognised as a comparatively cheap medium for maintaining contact with the area. Russell Marshall, no less under budgetary pressures than had been his predecessor in 1982, declared that at a time when economic restraint limited New Zealand’s role in the South Pacific, ‘an effective short-wave service will be a tangible expression of New Zealand’s commitment to the region”. More significantly, the new service would be given a higher priority than anything else being done by the ministry. It is a measure of that commitment that Ian Johnstone was appointed manager of the upgraded service. A former Radio New Zealand announcer and news reader, he had moved long ago into television and was familiar to the public as the co-presenter ad associate producer of Television New Zealand’s Crimewatch programme. He still spends three days a month with the programme. More fundamentally, the English-born Johnstone has had a love affair with the Pacific ever since he first visited Fiji as a stopover on his way to New Zealand in 1961. He has worked for the South Pacific Commission (between 1971 and 1975, when he was responsible for developing broadcasting in the region) and he has written and presented television documentaries on Fiji, Western Samoa, the Solomons, Papua New Guinea and French Polynesia. He is a founding member of the Pacific Island News Association and a former council chairman of Volunteer Service Abroad. His empathy for the Pacific, and his concern not to be a post-colonial intruder, is obvious, too, as he talks of his job. He is anxious that his service does not sound like “the voice of God”, which he describes “with deference to our Aussie neighbours” as “an august presence”, sonorously presented as if it is addressing the world. “What we want to be is the South Pacific’s community radio service. We still want to be credible and objective and all those things but we try and catch the Pacific flavour because we know we’ve only got a small area that we are serving. Radio New Zealand International is broadcasting 14 hours a day in – over a fortnight – 14 languages. The Radio New Zealand International team. So what is the ministry’s influence on such thinking? None, apparently. White the ministry provides the funding (which can be supplemented by appropriate sponsorships), the service is run by Radio New Zealand under an agreement that gives it editorial independence. The agreement does require that the ministry be consulted before the service expands into a new language, to determine whether the priority should be Indonesian, Japanese, Chinese... or whatever. For now, there are 14 languages over a fortnightly cycle. The daily service starts at 6am with a four-hour breakfast session, which has taken some adjusting to get right. The idea is to follow the sun, so they start by greeting the Cooks, then French Polynesia, and they move across the spectrum until they have delivered a timely “good morning” to each country in turn. Evenings are dedicated to magazine programmes that either they make themselves, or “Mailbox”, pitched at ‘DXers’, or a special interview like they had with Cook Islands leader Geoffrey Henry when he visited the capital. Then there are dedication sessions, linking communities in New Zealand with those at home. Originally published in the Ansett in-flight magazine "Southern Skies", October 1990. Scanned from a scrapbook of broadasting media clippings, part of the Mark Nicholls Collection. 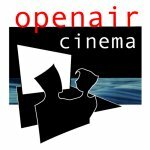 "We have no money, so we have to think." "I really love what you're doing"